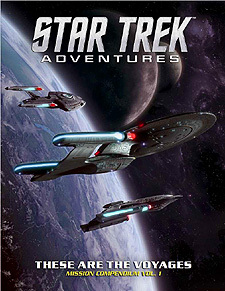 These are the Voyages: Mission Compeendium Volume 1 presents eight ready-to-play missions for Star Trek Adventures. Within this book, Gamemasters will find the means to test their Starfleet officers at the front line of Starfleet operations. This book requires the Star Trek Adventures core rulebook to use.